If you want to know what I miss most about living in Goa let me tell you right now that cabbage is not on top of the list. I don’t know what it is about cabbage but I went through a phase where I decided I did not like it at all and that was that. I would force myself to eat it, swallowing it with water not because I had to finish what was on my plate but because I had declared myself the household’s biggest lover of vegetables. Hence my not liking cabbage was downright embarrassing to that title. So I ate it all or asked for help from Grandma, who came from a family of many where wasting food was simply not an option (Gayle had a daily problem with this and would whine off everything she wouldn’t eat to grampsi. Funny how she’s now the chef). In my now this here life in America, I spend a fair amount of time thinking deeply about how life was for me back then. I’m talking full blown dissection of events that have led up to whatever moment I’m trying to “full circle” in this wonderful car horn-less world I inhabit. IT’S SO FING QUIET. So yes, I thought a lot about cabbage. And what I came up with in regard to this whole dislike of this particular brassica is that we always seemed to be eating it at home. Palak paneer was for the weekend but what about bhendi (okra) my favourite?! Those dried baby prawns that they added to the cabbage didn’t taste very good to me and I was always scared I would cut the inside of my mouth eating one. I have grown up and out of all those fears since. I have also figured out another logical reason why we ate it so much. Cabbage is huge. A whole head of it can easily feed a large family. Considering that in Goa we always have at least 2 or 3 sides with our rice and curry, that cabbage would be going a long way for more than just a day. It just makes sense to cook it more than once instead of wasting it. Grandma would most definitely agree. I cooked my first purple cabbage in my five years here, last week. I had half a head of cabbage from the pickle I made last week and out of nowhere, I decided I wanted to eat foogath with chapati. When I lived in Bombay with my roommates in the 400004 (this place), our landlady Aunty Myra would buy chapatis made by a family in the one room house a few meters away from hers on her way home from church in the evening. She would pass them them the money and they would hand her the chapatis they were making at the doorstep. Her days consisted of preparing ingredients to cook us all dinner and instructing and consoling Celine her house help for whatever reason. She would set out to buy vegetables from the market and some days it was fish at the front door from Sandhya (who used to talk very, very loud and Sandhya + Celine OMG I will never ever forget that sound). Aunty’s food was the best I had the entire time I was in Bombay and those chapatis – so thin and so round – begged to be rolled up with whatever vegetable she made that day. Even though she didn’t have to make us lunch, some days I would come home from college at the right time and she’d always offer me chapatis with the legume du jour. Foogath, as it’s called in Goa, is a style of quickly preparing vegetables by tempering spices and then adding onions, tomatoes, chillies, ginger-garlic and the vegetable to it and finishing it off with fresh coconut. It comes from the Portuguese word refogado, which is what sofrito is to the Spanish and Puerto Ricans and soffritto is to the Italians and mirepoix is to the French. To make foogath, you always start with a base. In parts of South India, it’s called poriyal. In Maharastra, the term “sukka” (meaning “dry”) is used to describe this same dish. A lot of people – and I really mean everyone – who ask me about “Indian food” usually speak of it in terms of “curry”. Foogath is 100% Indian and is the opposite of curry. Not all Indian food is curry. In fact, we use that term loosely to describe gravies/stew-like preparations that are wet and can be scooped up with chapati or eaten over rice. Since we always have sides of everything with our rice and chapati, it helps to be able to prepare these sides quickly so that kids can go to school, mothers and fathers can go to work and each one of those people can come and have a re-heated lunch in the afternoon. That’s how it was at my house (thank you, parents) and minus my cabbage phase, I’m glad I wasn’t a picky eater. Because as hard as it is to cook for two people, it must have been an even bigger challenge to cook for six. Despite all of our complaints or whiny faces and sounds when their backs were turned, my parents always had something for us to eat, as did Aunty Myra. Twenty-nine-year-old me would never have imagined craving the same cabbage dish that I swallowed with water as a 12-year-old. One bite scooped and tucked in chapati and I found the reason why. It tasted like home. You can make this recipe with every single vegetable you can buy at the market. Some of the ingredients I’ve used may be hard to find at your typical grocery store but if you can’t find them, it’s okay (I think) to leave them out and to add other herbs or spices to make it interesting. It won’t be “traditional” but sometimes you just have to get lunch ready and get to work. Heat the oil in saute or frying pan on medium-high heat and add the mustard seeds, cumin seeds, curry leaves and the dried red chilli. The spices should sizzle as soon as they touch the pan. Saute them until they turn fragrant and the mustard seeds just start to pop (about 30-40 seconds). Add the onion and garlic and stir, letting it cook until the onions soften and turn translucent. 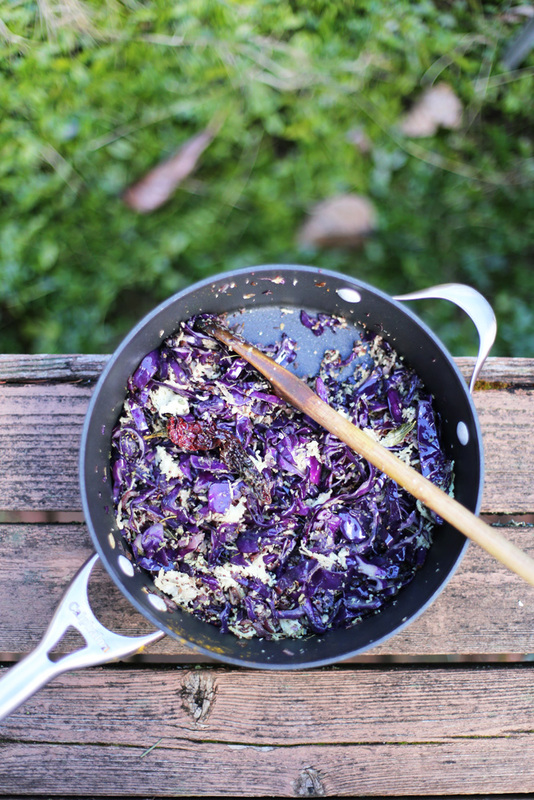 Stir the shredded cabbage into the pan and add the chilli powder and turmeric. Give it a big stir for about 2 minutes and then sprinkle about 1-2 tbsp of water to create some steam that will help the cabbage cook faster. Turn the heat down to medium and let the cabbage cook until it’s tender but still has some bite to it (taste test! ), about 5-7 minutes minutes. Once the cabbage is cooked, add the coconut and salt to taste. Saute for one more minutes and take the pan off the heat. Serve with chapatis or as a side with rice and curry. Squeeze fresh lime juice on the top before digging in. The recipe for chapati can be found here. My favourite atta (durum wheat flour) to use for chapatis is this brand. I love cabbage! We ate it a lot growing up too, but typically with Eastern European-style preparations… I can’t even imagine an Indian flavored cabbage + coconut dish, but I can’t wait to try! 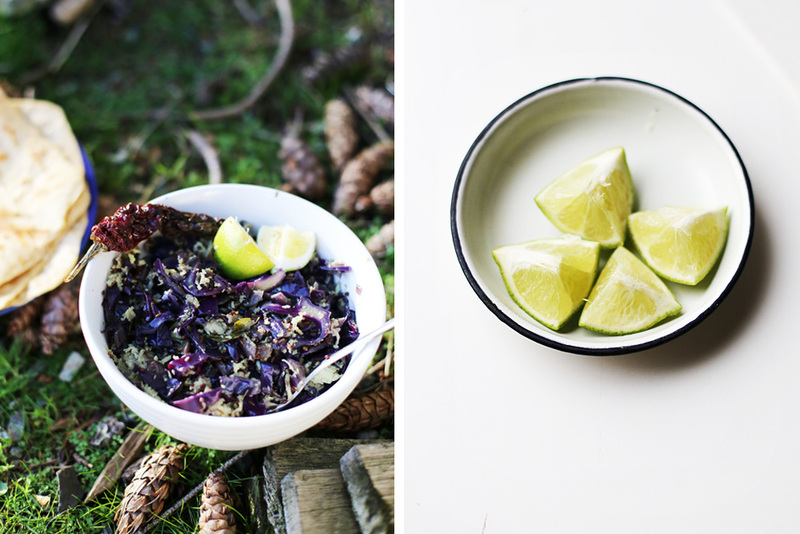 I love cabbage raw but I’m starting to cook it again and it’s working out quite well for my tastebuds. There’s an American-friendly version of this dish on last month’s Food and Wine minus the curry leaves and coconut. So if you want to go that route, look it up! It’s a Julia Turshen recipe. I think I’ll try this with a big head of broccoli that’s languishing in the fridge just now. Thanks! Both my daughters are going to the Emerald City ComiCon in Seattle this weekend so it’ll just be my husband and I and I bet we can eat the whole thing! Never heard of that dish before. We are cabbage lovers so definitely gonna try out someday.